Davio's, the Northern Italian steakhouse in Center City Philadelphia (111 S. 17th St.), is hosting a gluten-free beer dinner on Tuesday, October 11 from 6 p.m. to 9 p.m. Each of the four courses will be paired with selections presented by Magners Cider and Redbridge beer, including items such as Prosciutto Wrapped Scallops with Pistachio Risotto and a Cider Vinegar Reduction and Braised New Zealand Lamb Shank with New Potato, Roasted Pumpkin and Natural Thyme Jus. The dinner is $50 per person (tax and gratuity not included). 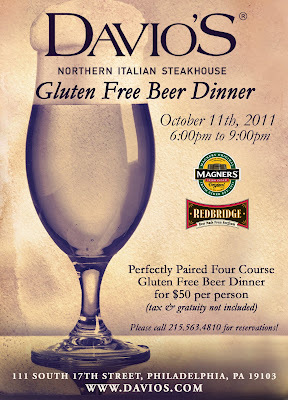 Reservations are necessary for this event by calling 215-563-4810. Davio’s offers an extensive gluten-free menu available everyday for lunch and dinner that includes pasta.